Thats right. Provo’s monthly picnic is upon us again. Pack up a lunch jump on your trusty steed, and come out for bicycle fun and friends. I think I have been to almost everyone of these and can honestly say they are a blast. Not only do I get an excuse to ride and eat (probably my two favorite things), I also have met a lot of amazing bicycle people. Check out the Facebook event here. What Do You Love About Bicycling in Provo, Busy Mom Sariah Hillam? Sariah Hillam is a busy mom that works tirelessly to improve our community by volunteering in many positions. She’s currently serves as the chair of the downtown Maeser neighborhood, a PTA member, and a Provo CDBG Social Service Committee member (the group that decides which non-profits to fund). How does she get to all her meetings? Often, she travels by bicycle. 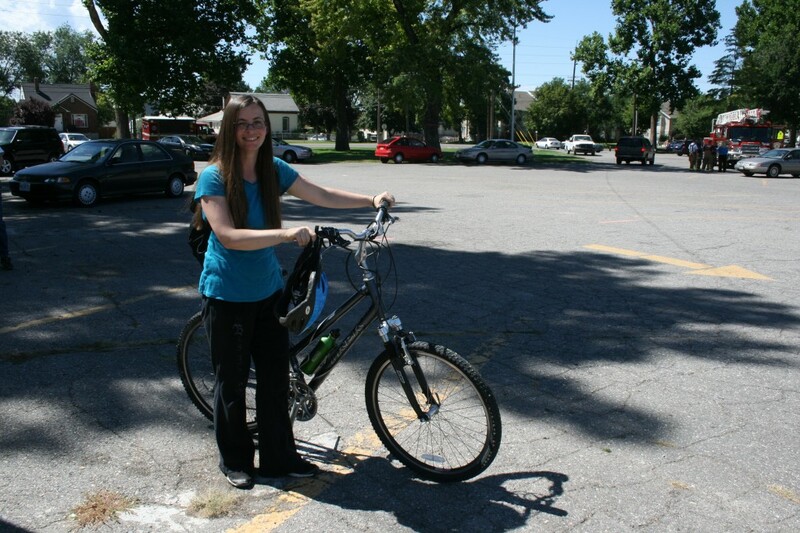 Here she is, showing off her sporty Trek bike. She can also be seen around town touting a bike trailer or heading up a bicycle parade of younger Hillams. Thanks for helping make Provo great, Sariah! 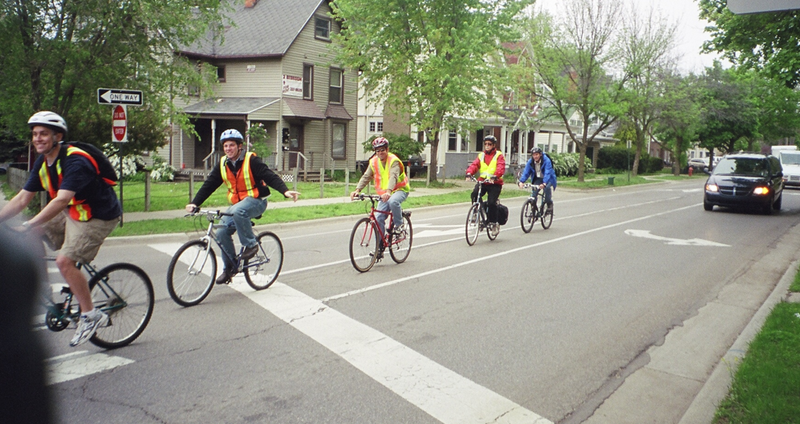 If you see the Hillam parade pedaling through your neighborhood, be sure to give them a wave! Tell us what you love about bike riding in Provo!Whether you’re a hard-core mountain biker or a casual cruiser, I’d love to share your story. It takes only a few minutes to snap a picture of you on your bike and ask you two questions: 1. What kind of bike do you ride? 2. What do you love about riding in Provo? See, it’s easy. 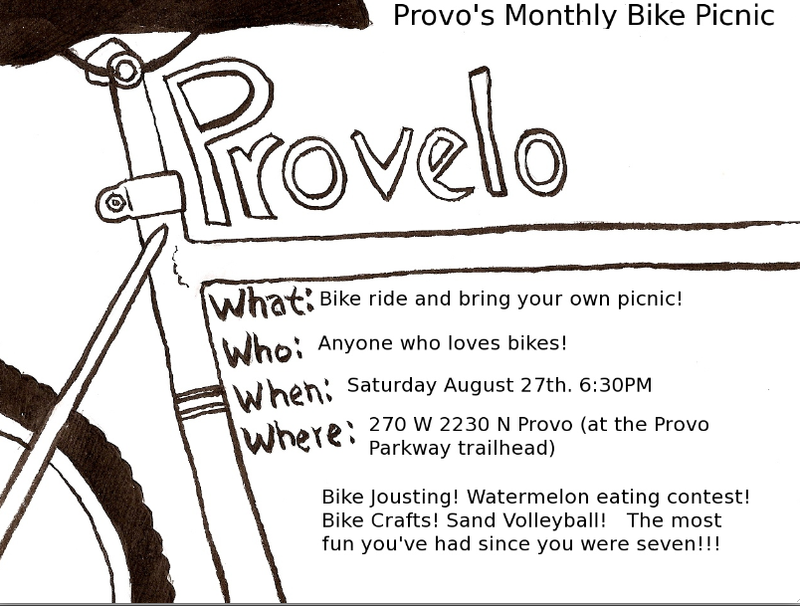 If you’d like to participate, just send an email to: bikeprovo @ gmail. 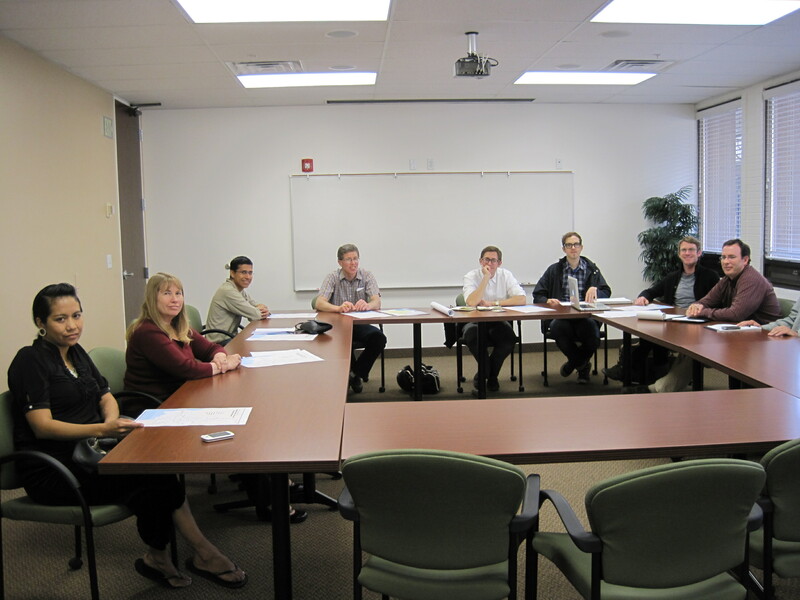 With the new bike study, safe routes to school, and all the bike events around the city, tomorrow’s Provo Bicycle Committee Meeting has a lot to cover. We’d love to have you come, share your thoughts, and help us make our city an even more amazing place for cycling. When: August 25, 5-6 p.m.
Why? To make Provo the perfect place for bikes! This week we will be organizing our efforts for Bike To School Week, which will be taking place on the third week of September as well as looking at a few initiatives that have been on going over the summer. We are looking for people to help head up events at their school or at their children’s school. Self Inflating Tires? Not A Problem. This could be really really cool. Remember when you were in middle school and bike riding was all about building sweet jumps (one cinder block and a piece of wood), hanging out with your friends, and having a little extra freedom? In short remember when riding your bike was just plain fun and exciting? Something that I have noticed lately in the biking world is that some people have forgotten how to have fun. The riding becomes all about gear ratios, or calories, or how to get from home to whatever destination the fastest. 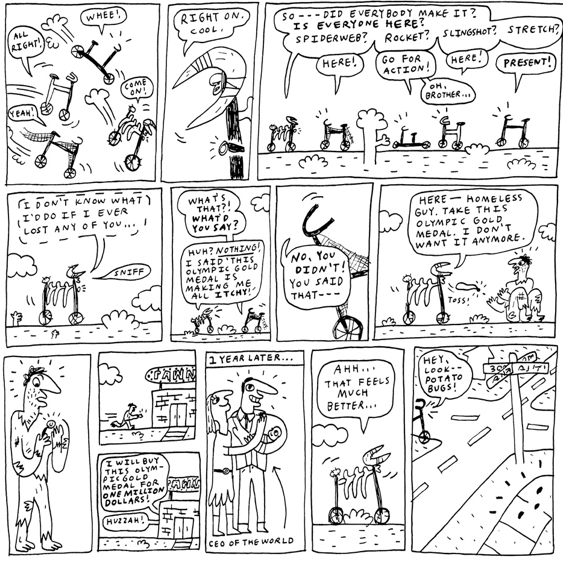 That is why I am so excited for a new bicycle comic coming out by our very own Jess Smart Smiley. Jess Smiley is a great guy, a great guy with a vision. His vision is one of bringing the fun back to comics and doing it the best way anyone could, by using bikes. Jess is a full time illustrator living in Orem with his wife and two kids. Over the last few years he has done design and illustration work for a ton of companies and anthologies, not to mention album covers for local bands, a graphic novel coming out this fall, as well as his most well known project to date, Will Draw For Coco (Jess drew a picture of Conan O’Brien from each show for three months). On top of all the awesome work he has done, and the fact that he does what he loves for a living, Jess is also a really nice guy. Most of what I know about Jess came from talking to him for this interview so, as to not dull his work or character with my words, lets jump into the interview. 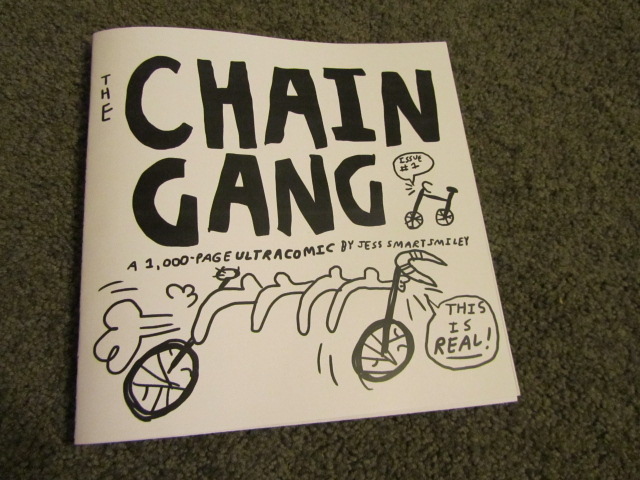 BikeProvo: So tell me about the Chain Gang? Jess: Well, it is a project that started up last spring sometime. I was riding bikes a lot and started sketching bicycles. A lot of times I will sketch stuff and not realize that I have a good idea until a while later, but this project kind of spoke to me from the beginning. 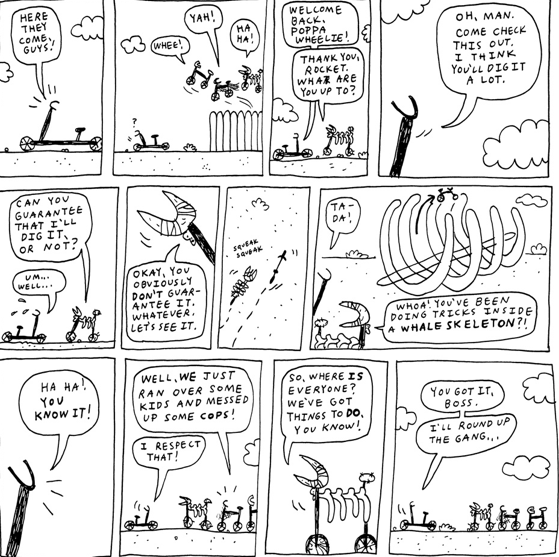 The comic is about a bunch of bikes who have been abandoned and so they are out for revenge. They ride around getting into to trouble while having all sorts of adventures. BP: That sounds great! What was your inspiration for the comic? J: I wanted to bring the fun back to comic books. It seems like you can not pick up a Batman comic or an X-men comic without there being some heavy undertone like gender issues or some other major social issue. I missed the days when you read a comic book and the good guy beat the bad guy and that was what it was about, it was fun. That is really what I hope people get out of this project is that feeling of things being fun, and exciting. BP: Ok, back to your comic. You said you were riding a lot when you came up with the idea for The Chain Gang, how do riding and drawing come together? J: (Laughing) I know it may not have been very safe but, I actually used to draw while riding. BP: (Laughing) Yeah that does not sound to safe. How did that work out? J: It was actually really neat. I would have to draw the things around me or the things in my head while also watching for cars and red lights. It was definitely a different type of drawing, but I liked it. BP: Do you print these comics off yourself? They have a definite Zine feel to them? J: I do not print them off myself. 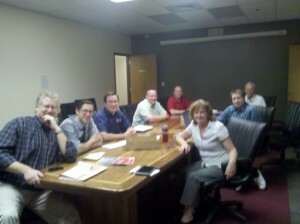 They are printed here in Orem to help save on the time of printing and stapling. I do definitely want them to have a DIY feel about them. The comic is drawn by hand with a micron pen and then I just scan in the drawn images to the computer and send them over to the printer. That is also the reason I decided to make the comic a monthly subscription. J: I wanted to have more of a connection to the reader. I wanted to bring back the feeling I had as a kid of going into a comic book store every other week and picking up the new issue of my favorite comics. I also really liked the idea that people would be waiting for something cool to come in their mailboxes. BP: As far as the drawing goes what is your process. I am assuming these are not drawn from the saddle of you bicycle? J: No (laughs) they are not drawn from the bike. My process with this comic is actually a lot different than with any other that I am currently working on. Again, I want this to be fun for everyone, including myself. As far as drawing out the comic goes I will sit down and draw out each panel as I go. It is a panel to panel discovery. I have an idea of where I want the story to go and figure out the rest on the fly. I think this gives the comic that goofy sense of adventure and fun that I want projected. BP: Now that we know about the ideas behind the comic can you tell us a little bit about the main characters? J: Sure! First you have Poppa Wheelie he is the leader of the Chain Gang, then you have Stretch who has a slinky in part of his frame, then there is Rocket who is a super fast lowrider, and finally Spiderweb who is an old bike covered in spiderwebs he can also shoot the webs to catch things. There will also be a rotating cast of 25 other bikes that the Chain Gang will interact with for better or worse. BP: What about some of the adventures the Chain Gang is going to have? J: There is quite a few just in the first comic. Do you want me to go into all of them? BP: How about you just list them off. J: Ok. In the first comic the Gang; catches a cop in their web, runs over some kids, jumps fences, rides in a whale skeleton, beats an olympic gold medalist in swimming, runs into father time, and gets sweaty. I may have missed some but that is most of it. BP: You were not kidding that does sound awesome! 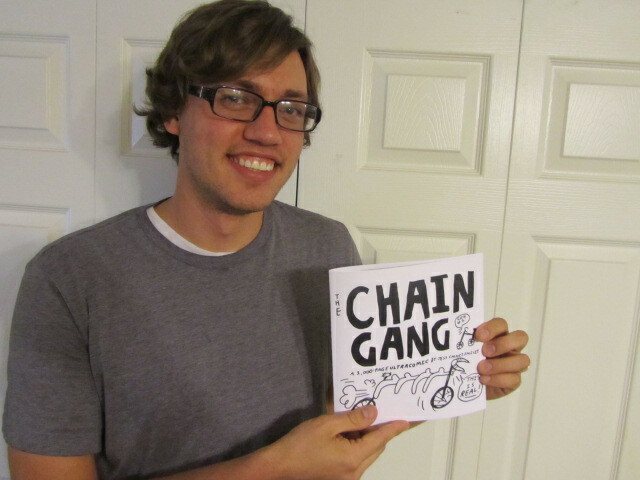 So how can we get our hands on a copy of the Chain Gang? J: Get on Kickstarter and sign up for one of the subscription options. Then just wait until October when the first issue will be released and shipped to your mailbox. A big thanks to Jess for giving us some time for the interview, and for using his sweet skills to make bicycles and comics fun again. During the interview I was able to thumb through the first issue of the Chain Gang and I can honestly say it was awesome. Head over to Kickstarter to check out Jess’s project and get yourself a subscription. There have been some pretty cool videos running around the Intraweb lately so we decided to throw a few of them together for you here. Enjoy. First off we have the amazing smooth riding of Danny Macaskill. This video has it all cineomotography, good music, and gravity defying riding. Next on the docket is something for all you Polo riders. Now if only I could play half this good. The song in the video may no be for everyone so, if you are not into rap open a new window and play this song while you watch. These Chicks Bad from Mr.Do on Vimeo. I have mixed feelings with this next video. It is really beautiful and nice and seems to be saying that riding a bike is better than driving. However it may fall a little short of its goal. Enjoy this video and check the next one for comparison. Now, this video from New Belgium Brewing gets the whole bicycle commuter/car commuter dichotomy a little more accurate. At least this portrays the difference between the way I feel when I bike my drive. Last but definitely not least is an awesome classic that has been making the rounds lately. This is a great old video about the Tour De France before super fancy bikes, and race radios, and VO2 max. Now that you have seen skills, beauty, and speed. Get in your respective saddles and go for a ride. What good is making a video about riding if all it does is makes us not ride. See you out there. If you have been reading BikeProvo for the last month or so you will notice we have had a great many posts about the Tour of Utah. This is because the Tour of Utah is a big deal for our wonderful little city and we want to have as much support as possible for the event and these great athletes. Even if you are not a spandex fan, or a sports fan in general, it is pretty cool to see someone in person going 30+ mph up 900E. Today is the last day to sign up as a volunteer so if you are able to give a few hours to the Tour click here and sign up. We may have a follow up post sometime today with a little more information for volunteers so pop in once or twice today just in case. The ride will pass by the Shops at Riverwoods, but end in the business park. The ride enters southeast Provo on South State Street, heads north, picks up 900 East crosses Center Street and rounds the corner just past the MTC and heads west down 2230 North. A sharp turn north on University Avenue headed to 4800 North, another sharp turn west, across the Provo River and a spring to the finish on 300 West in front of Vivint. We welcome all to watch and cheer along the parade route. 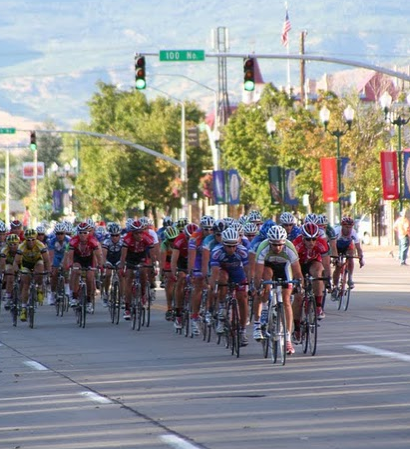 We anticipate the peleton entering into Provo about 1:30, at which point the entire route will be closed down. There will be some limited east/west cross over but the route will be essentially closed to north south traffic along the route. Once the riders and support cars pass, there will be a rolling opening, very similar to a presidential motorcade. We hope you can all make it out for this great event. Even if all you do is step outside your house and cheer the riders as they go past. It’s official! Provo has just secured a group to help us analyze and build up our bicycle infrastructure. This is in conjunction with the $110,000 grant that we have received for the same purpose. Over the next six months to one year we will keep you posted on the developments and public meetings that are part of the process. Note that I typed ‘public meetings.’ We will need all of you, your friends, and family out to make sure this plan reflects all of Provo and all of Provo’s needs. Plain and simple this is GREAT news and we are all very excited to get to work. A big thanks to all those directly involved including UDOT, Mountainlands, Provo Engineering, Mayor’s Office, City Council, and the Provo Bicycle Committee. Also a big congratulations to the winner of the bid which will be announced once some finalization takes place. If you were contemplating a bike ride any time today jump in the saddle and enjoy our wonderful city while celebrating this huge success for bicycles. 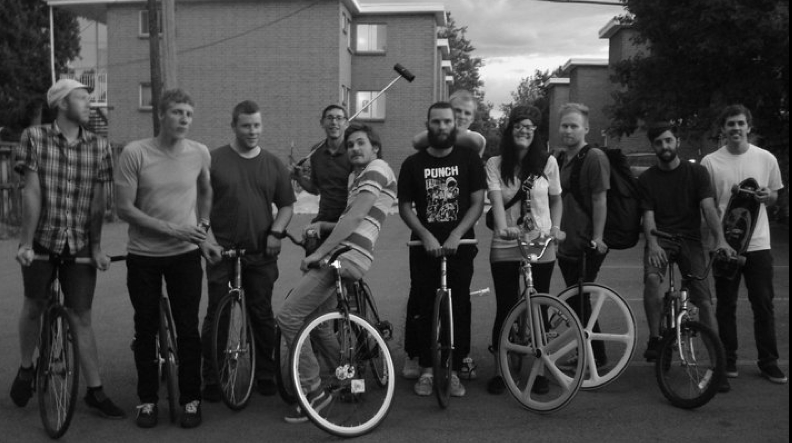 So we have received quite a few queries on the whereabouts and whenabouts of bike polo. We were not sure our selves since there was the potential of things shifting around a bit. But, thanks to the incredible Brake Bikeman, there is now a Facebook group where you can get your polo fix. Go here, join up, and come have fun. Here is the info for this week. What: These are just fun games were everyone gets together. The games are not super competitive and you can play on any bike you wish. Well there you have it. Hope to see some of you out this week for good times and great riding.